Онлайн инструменти, които биха ви спомогнали в избора на цветова гама, на близки цветове, на подходящи цветове, дори на допълващи се цветове. This entry was posted in Colors, Design and tagged цветове, цвят on 10.17.2014 by admin. tintui.com – A very useful color picker tool by João Piedade with all the famous UI colors in one place. 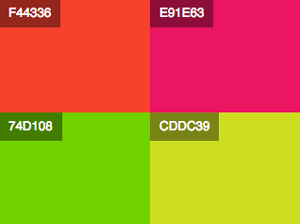 Colourcode is another one which offers a very original-yet-easy way of creating them. The color schemes are generated with the mouse location/movements and multiple options exist for setting the scheme type: monochrome (with light/dark grey), analogic, triad and more. Once created, it can be downloaded as styles (.less and .scss) or .png. It is also possible to save the palette for future use or share with a link. Colourcode can be used freely online or, it is open source, it can be self-hosted. COLOURlovers, an impressive website/community focused on colors, is sharing a handy tool named COPASO. 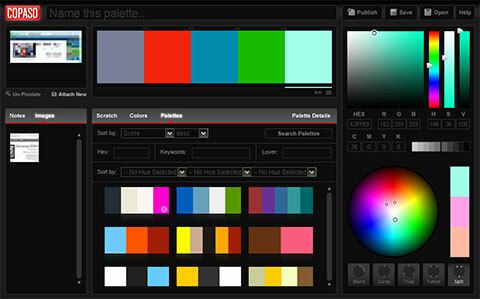 The tool is a web-based color palette generator for creating palettes and saving them for future use. COPASO allows you to pick the colors from a color wheel or upload an image, optionally pixelate it, and grab from there. There is a built-in search to find colors and palettes generated by the community with a sorting feature using various parameters. P.S. Some features requires signing-in with a free membership. This entry was posted in Colors and tagged colors, generator, palette on 10.31.2013 by admin.